Developed for the University of Oklahoma with funding from the National Science Foundation, RaXPol generates rapidly updated images of tornadic storms. Using a high performance 2.4 m diameter dual-polarization antenna, and equal-power V/H polarization on transmit, RaXPol can generate full-storm volume images of reflectivity, Zdr, Kdp, and HV correlation coefficient in less than 30 seconds. Pazmany, A. L., J. B. Mead, H. B. Bluestein, J. C. Snyder, and J. B. Houser, 2013: A mobile rapid-scanning X-band polarimetric (RaXPol) Doppler radar system. J. Atmos. Oceanic Technol., 30, 1398–1413, https://doi.org/10.1175/JTECH-D-12-00166.1. Arthur Witt, Donald W. Burgess, Anton Seimon, John T. Allen, Jeffrey C. Snyder, and Howard B. Bluestein. (2018) Rapid-Scan Radar Observations of an Oklahoma Tornadic Hailstorm Producing Giant Hail. Weather and Forecasting 33:5, 1263-1282. Howard B. Bluestein, Kyle J. Thiem, Jeffrey C. Snyder, and Jana B. Houser. (2018) The Multiple-Vortex Structure of the El Reno, Oklahoma, Tornado on 31 May 2013. Monthly Weather Review 146:8, 2483-2502. Jana Lesak Houser, Howard B. Bluestein, and Jeffrey C. Snyder. (2016) A Finescale Radar Examination of the Tornadic Debris Signature and Weak-Echo Reflectivity Band Associated with a Large, Violent Tornado. Monthly Weather Review 144:11, 4101-4130. Howard B. Bluestein, Michael M. French, Jeffrey C. Snyder, and Jana B. Houser. (2016) Doppler Radar Observations of Anticyclonic Tornadoes in Cyclonically Rotating, Right-Moving Supercells. Monthly Weather Review 144:4, 1591-1616. Robin L. Tanamachi and Pamela L. Heinselman. (2016) Rapid-Scan, Polarimetric Observations of Central Oklahoma Severe Storms on 31 May 2013. Weather and Forecasting 31:1, 19-42. Jana Lesak Houser, Howard B. Bluestein, and Jeffrey C. Snyder. 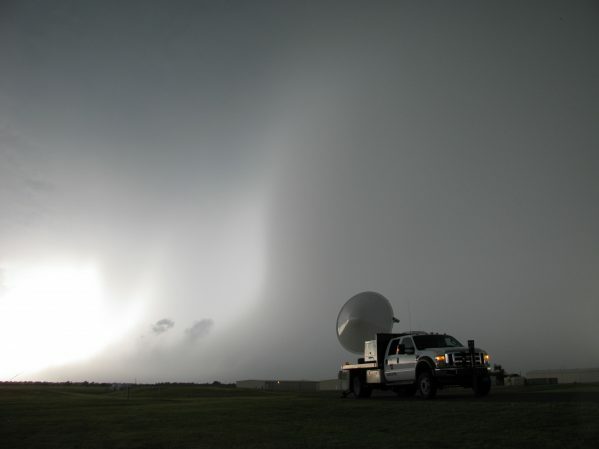 (2015) Rapid-Scan, Polarimetric, Doppler Radar Observations of Tornadogenesis and Tornado Dissipation in a Tornadic Supercell: The “El Reno, Oklahoma” Storm of 24 May 2011. Monthly Weather Review 143:7, 2685-2710. Roger M. Wakimoto, Nolan T. Atkins, Kelly M. Butler, Howard B. Bluestein, Kyle Thiem, Jeffrey Snyder, and Jana Houser. 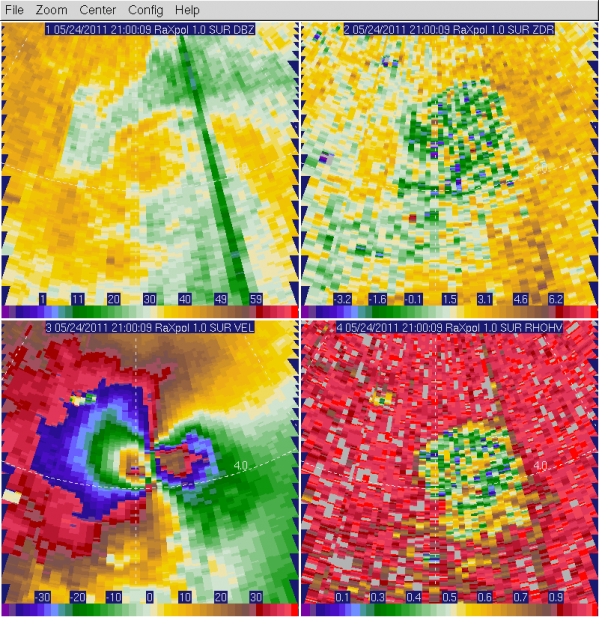 (2015) Photogrammetric Analysis of the 2013 El Reno Tornado Combined with Mobile X-Band Polarimetric Radar Data. Monthly Weather Review 143:7, 2657-2683. Howard B. Bluestein, Jeffrey C. Snyder, and Jana B. Houser. (2015) A Multiscale Overview of the El Reno, Oklahoma, Tornadic Supercell of 31 May 2013. Weather and Forecasting 30:3, 525-552. Example RaXPol polarimetric data set from a tornado. RaXPol can collect azimuth cross-section images like these at an update rate of 2 sec.